Welcome to Barry and Paul’s Predictions – The Final Reckoning. GW38 brought the season to a close in typical GW38 style. The final game-week of the Premier League often throws ups some unusual final scorelines and this season was no different; a 9 goal thriller in Spurs last home game at Wembley, City scoring a solitary goal in their win at St Mary’s, and of course my beloved Newcastle putting 3 past Chelsea without reply – Happy days! What started as an informal and innocent comment on another random article, asking you what you thought the game-weeks scores would be that week, has turned into something of an FF247 staple article now! Careful what you say around here folks, it can often rob you of hours of your life! That it then took on a life of it’s own is thanks to the continued engagement and enthusiasm from you lovely lot – so a massive thank you from both myself and my fellow Chuckle Barry (Matt) for making this happen. We would also like to announce that Barry and Paul are going global, which is a more exciting way of saying that we’ll be running a competition throughout this year’s World Cup finals. Some of you will be taking a well deserved break from all things ‘Fantasy’ this summer, but if you fancy trying your hand at predicting results throughout this years World Cup then this is the place to come. We’ll be posting up more details before you can say ‘England are going home’ or ‘England fans clashed with local police in Russia’. Before then we still have two weeks of results to reveal, and of course this season’s overall winner, so without further ado, lets see who did what, and how! 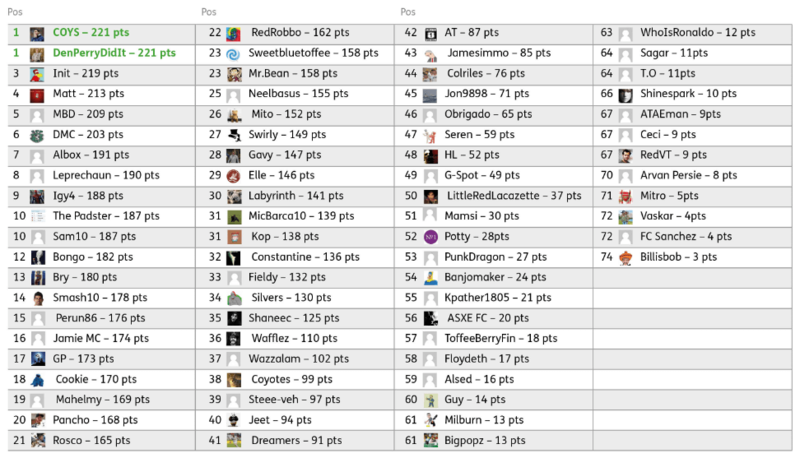 In GW37 it was Mr.Bean who took top spot; 13pts were just enough to see off second placed Neelbasus and DenPerryDidit, who both finished on 12pts. A whole host of teams were just behind them on 11pts in third, I’d tell you who they were, but Barry (Matt) didn’t tell me, so if you’re really interested then shout out and I’m sure he’ll let you know! In the final game-week, 12pts were enough to make Sam10 the winner, closely followed by yours truly with 11pts. Third place was a tie; Constantine and Albox both picking up a solid 10pts. Congrats Mr.Bean and Sam10, please email us at contact@fantasyfootball247.co.uk to get your hands on that FF247 t-shirt. So who won the 2017/18 Barry and Pauls Predictions overall league title I here you cry! Did Init do enough to hold on to top spot despite predicting a 0-11 score for Man City in GW38? It was apparent from the get-go that when it comes to this predicting lark, two of you are seemingly a cut-above the rest. Coys and DenPerryDidit have been making this look easy from day one, and in the end, it’s perhaps fitting that they both finished the season with an epic total of 221pts. Perhaps the pressure got too much for our illustrious leader? There have been rumours that perhaps in the name of good sportsmanship, he simply became a little ‘overly generous’ in his predictions (Southampton v Man City 0 -11 anyone? ), we’ll never know. Init finished the season just 2pts behind our leaders; 219pts wasn’t enough to for Init to win it (I know, I know) but it was a bloody good effort all the same. Congratulations Coys and DenPerryDidit. Perhaps it would have been better if Init had won, because now he needs to provide not one but two suitable prizes for your achievements, over to you boss! Email the site please both. -Buffon to join PSG on a 2yr deal worth 14mil ! After Buffon’s decision to step down & finish his career (for both Italy & Juve) the club offered the no.1 spot to Sczecny and is in the final stages of getting a new no.1 for the post-Bufgon era and as a back up to Sczecny – Matia Perin from Genoa (one of the best talents in Italy). Offers from his former club Parma ; Boca Juniors ; even LIV were mentioned but probably the €€€ + a possible CL title contender (PSG) was crucial for his choice. Eagerly waiting for tomorrow’s confirmation. But Dybala & Higuain are in !! Evening gents been trying to log into my fifa account with no luck no surprises there then anyone know how I can contact them ???? Done that serveral times Init can’t get on with any of my e-mails can you remember my team name on fifa was it Silvers or ALLWHITES??? From 4 years ago?! I’m good mate but…..
Can you not just create a new one?